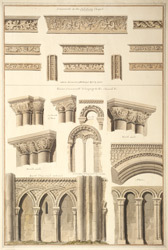 These architectural drawings include details of cornices, capitals, columns, arches and doorways from Salisbury cathedral. Construction of this cathedral in Salisbury Water Meadows began in 1220, replacing the Norman-era cathedral at Old Salisbury. Built under the supervision of master mason Nicholas of Ely, it was finished in just 50 years - a remarkable feat. The church's most distinctive features are its height and narrowness, which make it an exemplar of the Early English architectural style.